Lake Toba has long been on the radar for travellers to Sumatra, but the 6 hour bus ride from Medan is a challenge. The journey has now been reduced to around an hour and a half since Silangit Airport has taken on the role of the main gateway to the Lake. Lake Toba is the largest volcanic lake in Asean and one of the most beautiful lakes in the world. Silangit Airport Tapanuli, North Sumatra, is the closest international airport and AirAsia is has just added it to their network. The four times weekly service from Kuala Lumpur International Airport (klia2) will start on 28th October 2018. 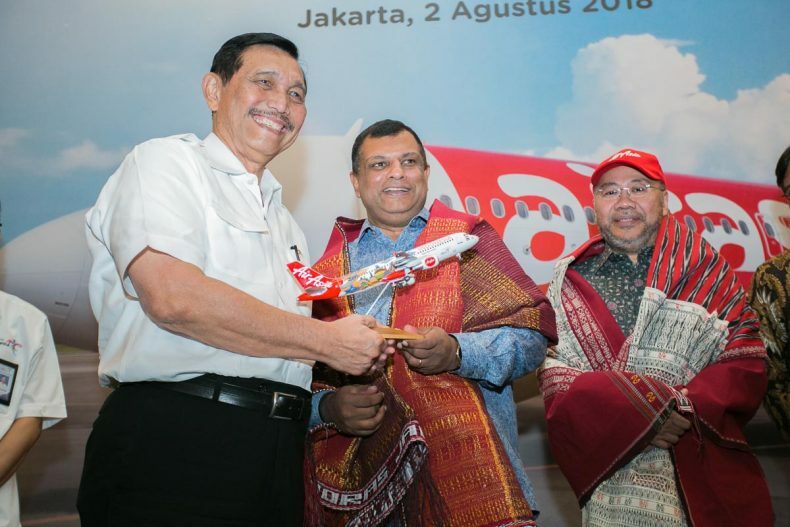 Tony Fernandes, AirAsia Group CEO, is a big supporter of ASEAN, with AirAsia Group airlines flying across the region. He spoke of the airline’s commitment to support the government of Indonesia in developing their 10 priority tourism destinations, including Lake Toba. You will definitely need transport to get around if you want to ‘see the sights’. We found this handy guide to tax fares on the Ministry of Tourism website. There’s a helpful list of things to do in and around the Lake Toba area at the bottom of the page. There are many beautiful spots all around the lake area and across Pulau Samosir in the middle of the lake. Closest to the airport, on the southern shore of Lake Toba is Pantai Bulbul, in the town of Balige, about an hour’s drive away. Sibolga, south west of the airport is on the western coast of Sumatra, close to Pulau Musola. AirAsia is offering special introductory all-in, one-way fares from Kuala Lumpur to Silangit from MYR 39.10*. These fares are available for booking on airasia.com and the AirAsia mobile app until 12th August 2018 for travel between 28th October 2018 and 29th March 2019. *Promotional all-in-fares quoted are for one-way travel only inclusive of taxes and fees. Fare shown are for BIG members only. Terms and conditions apply. BIG members enjoy zero processing fees when making payment using their BigPay card. Members can also redeem a one-way flight from Kuala Lumpur to Silangit starting from 10 BIG points (base fare only).